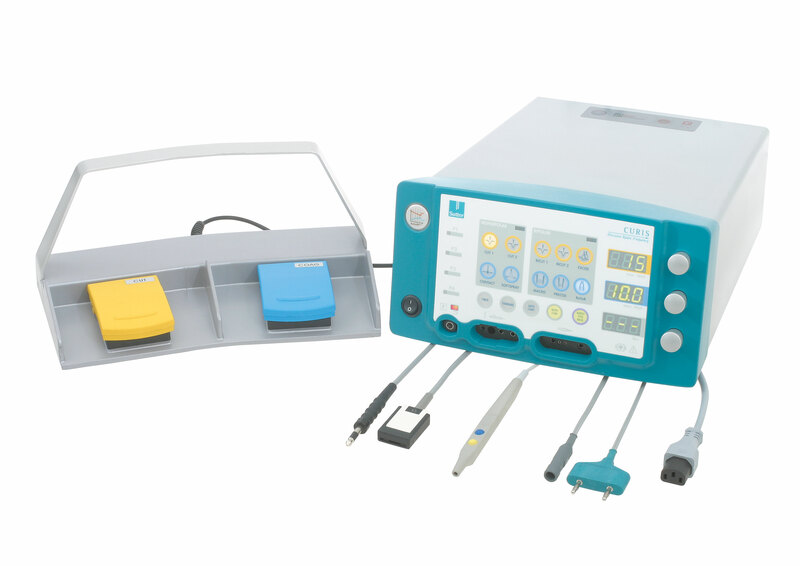 AutoRF™ is a smart impedance control function that will tailor the power output of the CURIS® 4 MHz radiofrequency generator to the tissue condition. Whether it is cutting through different types of tissue (such as mucosa, muscle, fat or connective tissue) or altering tissue conditions during coagulation, the AutoRF™ feature will deliver adapted power output as required by the different tissue impedance. When dissecting different types of tissue in one cut (skin, fat, muscles), the unit has to process and respond to the AutoRF™ data in a flash. For this reason, the CURIS® 4 MHz radiofrequency generator has two microprocessors for additional safety and speed. p3TM, which stands for pulsed power performance, is active in all coagulation modes of the CURIS® 4 MHz radiofrequency generator. Radiofrequency energy is delivered in about 50 small packages per second. Due to the pulsed power output, there are short breaks between the individual packages, giving the tissue enough time to absorb the energy. Highly focused, yet gentle coagulation with minimal thermal damage is possible. The CURIS® 4MHz radiofrequency generator offers clinicians and private practitioners coverage of an outstanding breadth of ENT indications. In our product catalog, you can find various examples for the different fields of ENT surgery. power adjustment depending on actual tissue impedance aid in creating consistent and repeatable lesions. As soon as the right size of a lesion has been achieved, the CURIS® 4 MHz radiofrequency generator will automatically stop the activation (AUTO STOP mode), and give an acoustic signal. The treated tissue is decomposed by the body’s own immune system and transformed into fibrous scar tissue. This process leads to a shrinkage and stiffening of the treated area. Sutter has developed different bipolar electrodes for the treatment of sleep-related breathing disorders based on the anatomical sites of obstruction. If desired, an acoustic feedback function (AUDIO FEEDBACK) can be activated. While a lesion is created in RaVoR™ mode, the change in tissue condition is signaled by a changing pitch: The further the lesion progresses, the higher the activation sound. "Bipolar radiofrequency volumetric tissue reduction, using Sutter technology, appears to have promising results for patients with snoring and mild OSA. One treatment session resulted in significant reduction in snoring intensity, improvement in sleep quality and QOL, and reduction of daytime sleepiness." Precise cutting allows the tissue to heal with minimal postoperative pain and scarring. The degree of hemostasis is determined by the surgeon. It goes without saying that the CURIS® 4 MHz radiofrequency generator will produce clear, clean cuts. This only works when the energy delivered is highly focussed and there is minimal lateral heat damage. The frequency of 4 MHz and AutoRF™ combine to create a homogenous electromagnetic field. For the unit to adjust to ever changing conditions during cutting skin, fat, muscle in one stroke, active performance control with AutoRF™ is able to ensure reproducible results. Best possible coagulation results can be achieved, according to the doctor’s requirements, with two bipolar modes. For instruments with wider tips of 1 mm and more, the MACRO mode is ideal. The advantage of fine instruments – their precision – is enhanced by the PRECISE mode, which can be adjusted in steps of 0.5 watts.